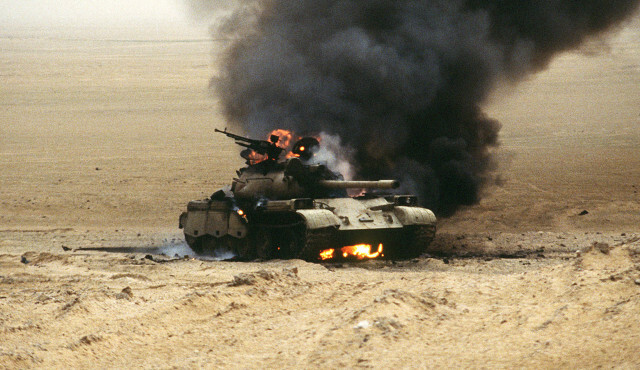 An Iraqi T-55 main battle tank burns during Operation Desert Storm. The “last great tank battle of the 20th century” took place on February 26, 1991, in the Battle of 73 Easting. The 2nd Armored Cavalry Regiment led a column of American tanks to end the Iraqi invasion of Kuwait. After encountering only light resistance for three days, they ran into one of Iraq’s largest armored formations. Captain H.R. McMaster (now Lieutenant General) commanded Eagle Troop, 2nd Squadron, 2nd ACR, one of the lead elements in the battle. Their mission was not complicated but it would not be easy to accomplish; they were charged with blocking the Iraqi retreat routes out of Kuwait and destroying the Iraqi armored forces somewhere in the desert. The challenges included a lack of navigable landmarks in the desert and storms that often limited visibility. First contact was made by Fox Troop and a few enemy tanks were destroyed. Over the next two days, enemy observation and scout vehicles were met and destroyed, but the main Iraqi Republican Guard divisions were nowhere to be found. McMaster led his column over a slight rise during a sandstorm on February 26 and immediately in front of them appeared an elite division of Iraqi tanks. The Iraqi position hid their tanks from the oncoming Americans and forced the Americans to drive down the hill to them. This exposed the weaker tops of the American tanks to the Iraqi guns. McMaster gave the order to fire without hesitation, knowing that the enemy already had them in range. However, most of the Iraqi scout vehicles had already been eliminated, so the Iraqis were caught off guard as much as the Americans. This left them unable to capitalize on their superior position. The opening shots defined the fight. McMaster’s first shot, a HEAT round, eliminated a tank. His second removed an enemy tank with a depleted uranium shell. His driver recognized that they had entered a minefield while they were preparing their third shot, and he had to maneuver to avoid mines. Bradley fighting vehicles joined the tanks. TOW missiles, mortar shells and artillery fell on the Iraqi locations. By the time the troop reached the line at which they’d been told to halt, they had destroyed 30 tanks, 14 armored vehicles and hundreds of infantrymen. Fearing a strong counterattack should the Iraqis regroup, McMaster ordered his troops to push on and continue the attack. McMaster finally halted the advance just 23 minutes after first contact. One armored troop had decimated the Iraqi flank without sustaining any casualties. Only one tank from the 2nd squadron was damaged, having incurred light damage from a mine. While moving to meet Eagle Troop, the Ghost, Killer and Iron troops were engaging with other Iraqi forces. The few enemy counterattacks were easily put down. That night, the American call to surrender was answered, with some 250 Iraqi soldiers surrendering to Eagle Troop. Eagle Troop’s success was echoed throughout the American lines. Iraqi losses were nearly 1,000 casualties, 85 tanks, 40 armored vehicles, 30 wheeled-vehicles and two artillery batteries. American losses were 12 soldiers killed, 57 injured and 32 vehicles destroyed or damaged.